To begin with its environment conservation project, Fiji Airways yesterday launched its ‘Every take off, one tree’ initiative by planting 500 mahogany plants in Nadi. 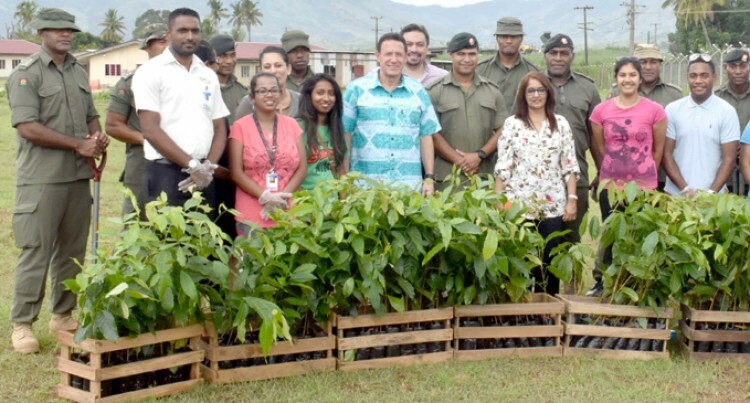 Led by Fiji Airways managing director and chief executive officer, Andre Viljoen and Hardwood Corporation Limited, they also marked the International Day of Forests at Blackrock Army Camp Votualevu, in Nadi. The ‘Every take off, one tree’ initiative means that for every international flight of Fiji Airways that takes off in a year, there would be a tree planted. Mr Viljoen said in a year, 2000 flights from the country’s international airport takes off. Therefore, 2000 trees will be planted this year. But these trees will be planted on a quarterly basis – 500 trees quarterly. He said the project was one of Fiji Airways’ key initiatives towards environmental conservation. “These mahogany plantations will be protected forests and grow to maturity without being harvested for lumber,” Mr Viljoen said. “As the country’s flag carrier, we see it as our duty to protect and promote the conservation of our country’s flora and fauna, as well as make every effort to mitigate the impact of our operations. “This is our commitment to Fiji and its future generations. “This action is especially imperative at an advent when nature is at its most vulnerable,” he said. The project was launched at Fiji Airways’ 65th year celebrations last September. Mr Viljoen has further encouraged stakeholders in the forestry, agriculture and rural development sectors to engage in the expansion of forestry plantations. This he said would be an environmentally friendly and economically attractive development alternative not only with mahogany, but with other high value native species. Fiji Hardwood Corporation Limited chief executive, Giuseppe Dal Bosco said they were happy to support Fiji Airways in this commendable initiative by supplying seedlings and expertise for their plant a tree programme. “These trees will not to be harvested and will remain for the benefit of future generations,” Mr Bosco said.